A nostalgic celebration of the fabulous fifties. The 1950s was a heady mix of American excitement - cowboys, rock'n'roll, Elvis, Marilyn Monroe - and the British sense of fun that included Airfix kits, Plasticine and Hornby Dublo trains. It was a boom time for DIY enthusiasts, seaside holidays and space fiction. The Fifties also saw the birth of self-service shopping and sugar-coated breakfast cereals. Ultimately, there was a new optimism that followed the Festival of Britain, the Queen's coronation, the end of rationing and the increasing distraction of a new entertainment - television. The Fun of the Fifties is jam-packed with over 500 colourful and evocative items, everything from tantalizing toys and electric kitchen gadgets, to frozen foods, furniture and fashions. Here too are the popular TV programmes that pervaded this remarkable era. This book is not only stuffed full of vibrant 50s graphics, but also reveals an insight into a decade of consumer change. 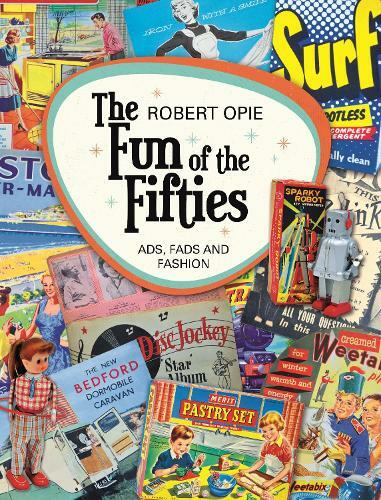 A celebration of this most memorable era, this book will take all those baby boomers back to their childhood - Noddy, Sooty and Muffin the Mule, Meccano, Magic Robot and Dinky Toys, Watch with Mother, road safety kerb drill and novelty soaps, Spangles and Corona drink.